Tim and I highly recommend a visit to the new South Lake Union Park. 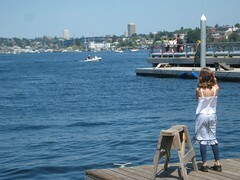 Situated on the south tip of Lake Union, next to the Center for Wooden Boats, it’s a surprisingly serene locale to have a picnic and enjoy the hubub that Lake Union has to offer. While we lament the short-sighted Seattle voters each time we go there, it’s still a great spot even if it’s NOT as good as it could have been. Tim’s office is not too far from the park so it’s a perfect spot for an after work date-I get a little exercise pedaling down there and he can stay and work a little longer and just breeze over when I arrive. A few weeks ago, I transported yummy Thai food and Mojitos in my sweet red basket, Tim pedaled over to the the nearby Whole Foods for some dessert and we met at the park for an early evening date. It was a beautiful evening with a nice warm breeze, lots of good boat and sea plane viewing and good company. We lingered as long as possible before we had to pick up the kids. Great date – we’d much prefer a relaxing picnic in the park to joining the hoardes of Seattleites waiting for a rare outside table in a restaurant on a beautiful Seattle evening. We returned with the kids for an impromptu visit after a movie the following week. We pedaled downtown for the first showing off Wall-E (a great flick for adults and kids and surprisingly disturbing for our seven-year-old). The park hadn’t been our planned destination–we were on our way home and decided to make a quick stop to let the kids run around before getting back on the bike for the last five miles to our house. The kids loved it. They got to blow off some steam, watch the sea planes landing and taking off on the lake and sit on the dock and dangle their feet in the water. What a great way to spend an afternoon. This entry was posted in alternative transportation, bikes, extravehicular activities, seattle and tagged bikes, carfreedates, dates, Family Cycling, kids, seattle, South Lake Union Park. Bookmark the permalink. Hey, so glad to see you enjoying the park! Wait until the other 10.4 acres are completed by summer 2010, and there will be a lot more to enjoy. You can see a visualization here: http://www.seattleparksfoundation.org/project_LakeUnion.html. Beautiful! Enjoy the summer guys. You’ve got some lovely places to make memories. Thanks for the comment. I attached the trailer right to the back hub. I just changed trailers though because I found one more conducive to two wiggly bodies and it attaches to the x frame. It actually rides really well. I’m so strong it’s C-Razy! I rode today with no trailer – mom’s morning out – and was passing everybody! It was rad. 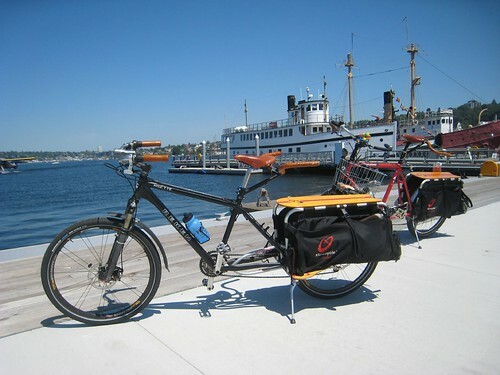 hi anne and others- i rode the Cheshiahud Lake Union Loop with some folks from the Seattle Parks Foundation today. they are doing some terrific improvements to the trail including filling in the missing links and adding signage. here is a link to a map that shows the draft route.